Gary, IN Brewery 18th Street Brewery releases “Homemade Hustler” beer in collaboration with Chicago band The Jordan Years. 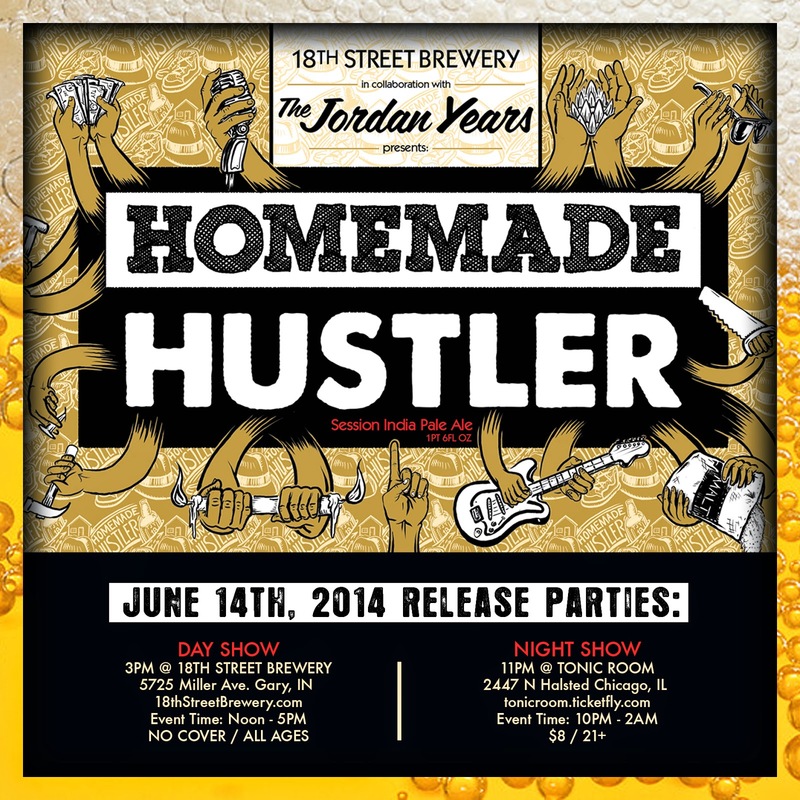 On June 14th, 18th Street Brewery will release “Homemade Hustler,” a new beer brewed in conjunction with Chicago band The Jordan Years. Each bottle will include a download code for The Jordan Years’ album of the same name. 18th Street Brewery will be holding a release event on June 14th and the band will host its own release party later that night at Chicago’s Tonic Room. In the fall of 2013, The Jordan Years played at the grand opening of 18th Street Brewery’s Gary location. When discussing the payment for their performance, the band jokingly asked 18th Street to create a Jordan Years beer, rather than paying them in cash. To their surprise, Drew Fox, founder of 18th Street Brewery, thought it was a great idea. After a few brainstorming sessions, they drove down to Gary one Monday morning to plan the recipe and lend a helping hand while Drew brewed the beer. The band had one request for the new beer: That its color should resemble that of the cheap beer they drank exclusively during the sessions for the “Homemade Hustler” album. Drew agreed, making sure to note, though, that the beer’s resemblance to macro brewed American lagers would end at its color. Brewing commenced and “Homemade Hustler,” a Session IPA, will be available to the public on June 14th. The Jordan Years and Fox met through mutual friends in the beer world and became both friends and fans of each other’s work. The Jordan Years used to frequently hold multiband concerts at their Humboldt Park studio West Town Recording and Fox, who was still brewing at home at the time, would bring over taps and kegs to supply the parties with beer. Also, they crossed paths at craft beer tasting events where the Jordan Years were performing and 18th Street were among the featured breweries. Working together on a creative project was a natural continuation of their relationship. There will be two release events for the new collaborative beer, both on June 14th. One will take place at 18th Street Brewery’s Gary location and will start at noon. The Jordan Years will be performing along with Chicago artists Phal and Cojack. The limited edition “Homemade Hustler” beer will be available for purchase in 22oz. bottles. Later that night, The Jordan Years will perform at The Tonic Room in Chicago. The bar will have “Homemade Hustler” on tap. The show starts at 11pm and MC ADaD will also perform. About The Jordan Years: The Jordan Years are a soul/rock band from Chicago. Staying true to the DIY ethic of the new music business, the band strongly believes in the power of a recording studio with no time limit and records and produces its own music. Since their inception in 2008, they’ve put out two well-received releases (2009’s See the Light/Warm Me Up 7” and 2013’s album Homemade Hustler) and have performed at the city’s major music venues. In addition to their own gigs, they’ve been an important part of the Chicago scene, whether it’s collaborating with a who’s who of Chicago hip-hop for a celebration of Dr. Dre’s birthday at the Double Door, or providing a live soundtrack for sketch comedy veterans Schadenfreude at Lincoln Hall. About 18th Street Brewery: Established by Drew Fox in 2010, 18th Street Brewery opened its brewery/taproom doors in the Miller Beach neighborhood of Gary, Indiana in late 2013. Conveniently located off the Dunes Highway and the Metra 'Miller' stop, 18th Street specializes in both big and small beers, from 9.5% barrel aged Double Milk Stouts to 4.5% Session Pale Ales. In January of 2014 Drew Fox was named 'Best New Brewer' in Indiana by Ratebeer.com.